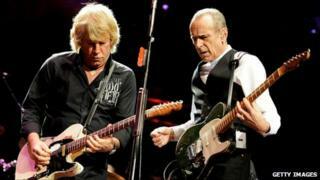 Rick Parfitt, of Status Quo, has been on the road with the Quid Pro Quo tour throughout November and December. Has he noticed a change in audience behaviour? "It's started to hit us," the guitarist admits. "Seat sales are staying relatively the same - we're not getting any bigger or smaller - but you do notice it in sales of programmes and T-shirts. "If you bring the family out to the gig, it's expensive enough anyway. We try to keep it down, but we have to move with the times. So you go out there and try to give great value for money - we've always given 100%. "But if we only suffer in sales of programmes and T-shirts then we're doing all right. As long as we've still got bums on seats, we're happy." Mick Jones, of Foreigner, told the BBC that his band had cut ticket prices as a response to the recession. "I think people are looking for more value for their money. We did a tour in the States this summer and we dropped the prices a bit and the attendance was incredible. I think it's only fair to do that in a recession. "A lot of tours didn't do well last year because of that. It costs a fortune to go to a concert, by the time you've paid for the T-shirt and whatever. It's a big night out. People are being a bit more picky about who they are going to see." His words were echoed by Ultravox star Midge Ure, who told the BBC: "The music industry is taking a bit of beating just now with illegal downloads and things, but you cannot replace live performance. "There's something about the atmosphere and the power that comes off the stage - you can't replace that." Phil Collins, the Genesis drummer and solo artist, says "the music industry always finds a way" during times of recession. I just want to make a statement that we're not all spoilt! Level 42's Mark King reveals that the band's last UK tour exceeded expectations. "We've done better business touring in the UK throughout October than we did on the last two tours - and yet it's harder times," he says. "It makes you think... live music gives you that buzz, to go and see the real thing is great." Paloma Faith, who has recently finished a UK tour, brings a different perspective to gigging during a recession. "I didn't tour before the recession hit so I only know it as it is," says the singer-songwriter. "But I do think that it's sad that a lot of musicians say 'we don't make as much money as we used to'. "I think they're all spoilt and I think that they're really privileged human beings. "I'm definitely earning more money than when I worked in a pub or on a shop floor now, so I feel really lucky that in the recession I'm earning money. I just want to make a statement that we're not all spoilt!"